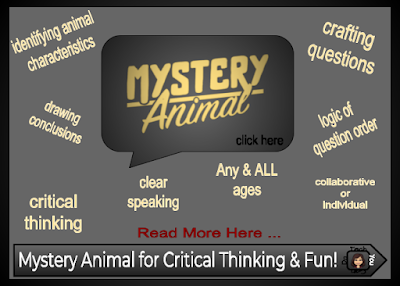 Game + Critical Thinking = Mystery Animal! Are you looking for an activity to help develop your students critical & logical thinking? Have an interest in animals? How about promoting clear speaking, taking turns, reasoning, and putting clues together to solve a "mystery"? Then you HAVE to check out Mystery Animal. Similar to 20 questions, you can ask up to 20 yes-or-no questions to identify the mystery animal. I've played this with students in the classroom and my own girls at home. I start out whole group and we brainstorm questions. Then we take turns asking, pausing to reflect/review what we've learned and decide when the right time is to make our guess. 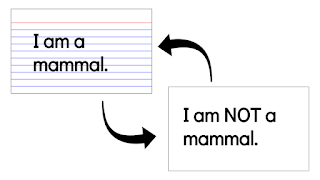 *** BONUS ↦ use index cards to write out questions to help students keep track of answers. (great for the little ones) Older students can devise their own information collection tool (blank paper works really well). Hold onto index cards for repeated play. There are 2 parts to today's resource ... the museum's website and the physical museum. Both are P-H-E-N-O-M-E-N-A-L! I encourage you to check them both out. The website is really the focus of what I want to share. I signed up for their e-newsletter (I encourage you to do the same). Being the history nerd that I am, I love reading all things history and one caught my eye because I clicked on the story of Otto Frank, Anne's father. I had no idea he'd made so made attempts to get his family to freedom! (There are several other stories on this site, too.) Everyone hears about Anne, but reading about her father's attempt to save his family took her story to a new level for me. I can totally see this providing primary sources in the classroom, whether for a specific study on the Holocaust or just for primary sources. There is also a section devoted to resources for educators (click HERE). I've been there more than a handful of times - as part of our 8th grade DC trip - and this is easily one of the toughest, yet most fulfilling stops. We simply can't devote enough time to it (I could spend days there!). And I always leave with a heavy heart. We've even been fortunate enough to be visiting when a survivor was available to talk to. What an amazing experience for anyone to experience! If you have the opportunity, VISIT ... and plan several hours ... and take your time. Admission is FREE, but you will definitely want to plan ahead because it can be very popular and total admissions are limited. If don't find yourself in the DC area, visit the website and check out all it has to offer ... virtually. You won't be disappointed. 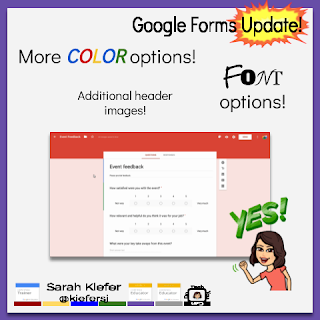 Google Forms Update! Woot! Woot! The day has come ... rejoice!!! If you are like me & you've been hoping - one day - Forms will allow you more control over the font of your Form and the colors of the Form ... the day has come!!!! G Suite users will soon (if not already available in your account) be able to do all of these things. Click HERE to read the official announcement from G Suite. Click HERE to go directly to the Docs Editor Help page which explains the "how to" do all these things. In my opinion, balance is a tricky word. Does it mean 50/50? Does it mean favoring one thing over another? Is it bad if you don't have balance? As a working wife & mom, I struggle with balancing home & work. When I'm at work, I'm still a mom. When I'm home, I am still an employee. In either place - in BOTH places - I'm an individual and a learner. I don't try to separate out these all these pieces of my life ... I may focus on each at different times or in different ways, but altogether, they make me ... me. Recently, I worked with two different groups of educators and as I drove home fairly late at night, the word "BALANCE" kept bouncing around in my head. Education was the topic for both groups, but in different ways. Reflecting on both discussions, I see the need for balance - or, striving for balance. I get asked and think quite a bit about "How much screen time?" ... "Can I/Should I print?" ... "How young is too young on devices?" ... "When do you give kids devices?" ... "How do I keep my kids safe?" ... "How much should be print versus digital work?" ... and so on. The questions above are all tough questions ... and ones that you can't really find "cut and dry" answers to. I always answer very honestly. Each child is different ... each home structure is different ... each classroom is different ... each game/app/website is different. There's no recipe to the perfect digital structure. So balance for each person, each home, each classroom, will be different. And that's okay! When learning, keep learning the goal and use paper and/or digital resources as they fit the goal. The latest, or fanciest, or the "coolest" tool won't always give you the best results. And the "coolest" pen won't give you the best looking handwriting, either, right? It's all in how you use it. With fun, keep in mind boundaries. I am a firm believer that kids flourish within boundaries. To stretch you a little more ... sometimes balance will mean putting yourself out there. In order to achieve a better balance, you may have to change the scales a bit. I reflect back a handful of years when my district went 1:1 with Chromebooks. Want to upset the balance of a building/district? 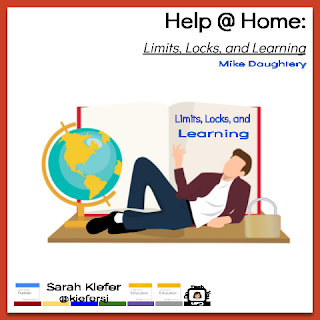 Introduce a take-home Chromebook program for your middle school & high schoolers! It very much upset our "balance" ... but NOW? Wow! The difference is astounding. Heaven forbid the wifi go out and we not be able to access the internet! These hunks of plastic roughly the size of a sheet of paper changed the way we "balance" education in our district. And every year, the balance looks a little different. I think balance is an elusive goal and I have no magical formula as to how to achieve it. And on that note, I'm not convinced balance is what I'm looking for. I think I'm looking to give each piece of my life it's proper due, and focus on each piece as needed. I've wanted to cover this topic for awhile, but wanted to do it well. Today I can share with you an EXCELLENT article that does it better than I could. Mike Daugherty originally shared "Limits, Locks, and Learning" on October 24, 2017, and I received it today via his newsletter "Help @ Home". This newsletter is free for anyone to subscribe to & I highly recommend it. I will add that I personally use an app called "OurPact" that allows me to do many of the things these offer. It has a free version (not many features) and a paid-for version ($4.95/month) allowing me to manage all 3 of my daughters devices. The set-up isn't the easiest, but once you are in, it works GREAT! Don't hesitate - don't wait ... READ IT then share it and save it! Do you teach the difference between primary and secondary sources? This site would be a great place to discuss the difference. Any historical topic ... dive in to see historical people and different time periods. Want to take a tour of the MOMA in New York? How about the National Museum of Modern and Contemporary Art in Seoul, Korea? Trip planning is a daunting task but Google is here to help, yet again! 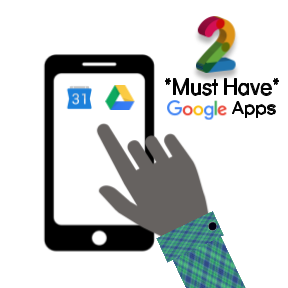 The focus of this article - the 3rd in a 6 part series - is how to utilize the Google Drive app and Google Calendar (also an app, but can easily be synced to your preferred calendar app). In this article for Nations Classroom, a student tour company, I highlight how beneficial using the Google Drive & Calendar App can be for trip coordinators. Easy & regular access are at the top of my list! But don't think they only work for trip planning! I use Google Drive & Calendar numerous times a day & since I have them on my phone for my school work, for my home life, and for the various other activities I'm involved in. Google Calendar's allow me to manage my daughters' school activities, doctor appointments, my husband's word schedule, sporting events, and everything else! Do you voice type text messages or notes to yourself? Do you ask Alexa, Google Assistant, or Echo to perform commands? Chances are you have at one point or another. Welcome to the world of voice controls! Our voices are powerful. And with every passing day, they become even more so. 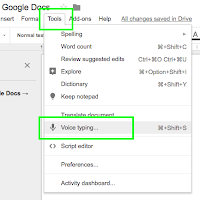 Google Docs included the ability to voice type awhile back and I demonstrated this tool to a group of students this past year. It is super easy to learn. 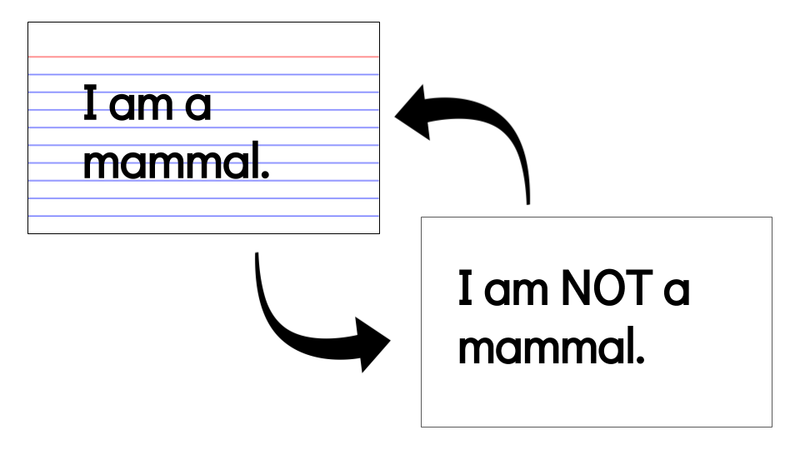 Demonstrate this tool to your students, AND encourage them to USE it! This tool was one of the most powerful tools I taught that group of students. They began using it on a daily basis. We noticed the microphone in the Google Search bar and the kids were excited to find out it works there, too! This helped their researching! 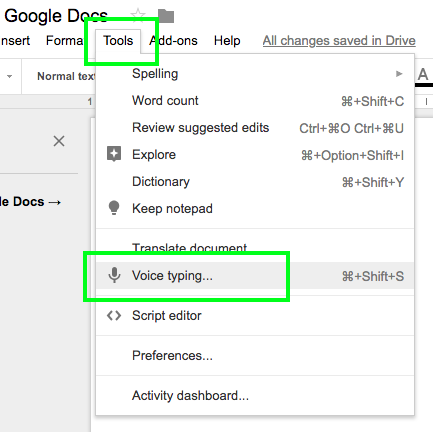 AND we found we can voice type speaker notes in Slides and them copy and paste them into the Slide as a mini-workaround. I know what some of you are thinking ... voice typing might "feel" like cheating. But it's NOT! This is where our thinking needs to shift. As a classroom teacher, I had many students who had great thoughts, ideas, and opinions but struggled when it came time to put the pencil to paper. When computers became the "norm" in my classroom, I believed this would help ... and it did ... for some. For others, typing is also a struggle. Contrary to what the non-educator community might think, summer is NOT a time where teachers turn their brains off. On the contrary, most educators I know spend a great deal of time planning, prepping, and learning for next year. They just don't have to do it within the contracted time or with 30 sets of eyeballs staring at them. Time in the summer is more forgiving ... more flexible ... just more. Time can be 15 minutes here, an hour there, or nothing at all during a family vacation. The reverse can also be quite true - time can be hyper-focused for an entire day to complete a workshop. If you are looking for ways to amp up your summer learning time, I've got a few suggestions. Chose one or two to try. 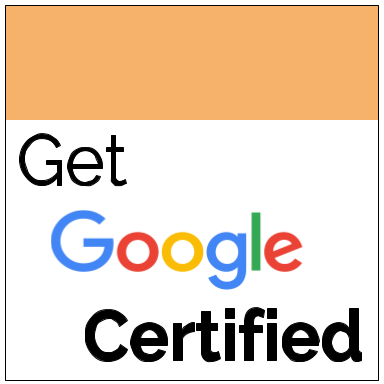 If your school uses Google, this is a fantastic way to earn FREE professional learning credits. There are 2 Levels - Fundamentals and Advanced. 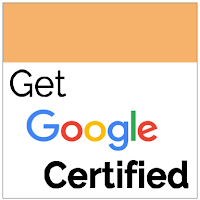 Getting certified was a goal I accomplished 3 years ago and I'd recommend it to ANYone! If you need help, feel free to contact me! If you are interested in learning Google in small pieces, Eric has over 30 webinars "on demand". They are roughly an hour long and after watching them, you have the opportunity to take a quiz and receive a certificate worth 1 contact hour. Once a month, Forward Edge (a company focused on providing technology to schools) shares a live webinar on a tech focused idea. Afterwards, you can access on demand. They are roughly an hour in length.